The source of the Three Families' wealth is their adrenal synthesis factories, which convert the Republic's processed Quesh venom into precious adrenals. The length of the process depends on the quality of the adrenals required; military grade adrenals take a week or so to produce, while cheaper ones can be created in days. The Three Families guard the secret of adrenal creation very closely, meaning access to the factories is strictly regulated. All Republic personnel working there have to be carefully vetted and vouched for, and are subject to search without warning by Three Families enforcers. To keep its partnership with the Three Families harmonious, the Republic employs harsh punishments for theft; it is not uncommon for thieves of a single adrenal canister to be jailed and fined the cost of an entire vat. As head of the Three Families, Broga the Hutt considered it his right to have his own private home and base of operations separate from the Three Families Palace. Stocked with well-trained slaves and imported luxuries from Nar Shaddaa, Broga's Palace gradually became a power center in its own right, which made the Empire's siege and capture of the palace all the more humiliating. Now held by the Imperial Moff Dracen, the defenses and strategic position of Broga's Palace have been turned against the Republic. With the Republic military focused on defending Quesh's miners and the Three Families protecting their mines, Broga has discussed hiring offworld mercenaries to retake his home... or to at least to reclaim his beloved wine cellar from Imperial hands. The Chem-Basin Mine has only been open for four years, but it has already earned a reputation for accidents and mismanagement. The original survey team was almost suffocated when the members accidentally released a pocket of evaporated Quesh venom, and substandard materials meant the initial tunnels had to be re-propped and re-dug after a major collapse. Ever since, problems have dogged the site and slowed venom production. Strangely, the miners who work at Chem-Basin exhibit a degree of pride in their mine. They claim any fool can work at the Grancha Lakand site and get results, but Chem-Basin calls for a degree of finesse that is scarce on Quesh. The subject is guaranteed to come up whenever Grancha Lakand and Chem-Basin miners are drinking together. Grancha Lakand is the largest and oldest venom mine on Quesh. Built through a fissure created by the Quake, the mine is named for its first explorer, who was trapped by a rockfall during his initial survey. By the time he was rescued, Grancha Lakand's adrenal countermeasures had worn off and he had been breathing Quesh venom fumes for some time. Lakand excitedly told his rescuers that he had had an epiphany while trapped. The biggest supply of Quesh venom on the planet lay beneath the fissure somewhere, and Lakand knew exactly where to find it. He was dismissed as a venom-intoxicated madman, but when Lakand recovered, he returned to the fissure and, after weeks of surveying, located a huge reservoir of Quesh venom. While not necessarily the largest on the planet, the reservoir has supplied the Grancha Lakand mine for several years without the venom running dry. When the Empire arrived on Quesh, its tacticians believed one swift strike would devastate the sparsely populated world. Instead, the Imperial forces managed to capture only a few mines and one processing station before they found themselves pushed back by the Republic. The captured processing station and its warehouses were soon converted into a garrison which remains the Empire's base of operations on Quesh today. The headquarters of Moff Dracen and his commanders was once a storage warehouse for the processing station's chemicals. It has been thoroughly cleaned and furnished to the standards demanded by Imperial officers, though the lingering smell has never been fully removed. Originally intended to be the Empire's base of venom research on Quesh, a variety of setbacks and concerted attacks by the Republic hampered the Empire's scientific studies at this outpost. Hutt Cartel forces have since been stationed here at the Empire's request, guarding the scientists and using the outpost as a staging point and repair center for their battle droids. Although the Empire's research is now considered safe from the Republic, the strong cartel presence has made some of the Imperial scientists uneasy. The cartel has repeatedly offered to help the Empire with its study of Quesh venom, but Imperial commanders are concerned that the outpost half-belongs to the cartel already. As the Republic's main source of processed Quesh venom, the Quesh Venom Refinery is one of the most secure locations on the planet. Cut by droids from a ravine created by the Quake thousands of years ago, the stone quarried was used to build the high walls around the refinery. The main courtyard is under constant guard, and access is restricted to dignitaries and scientific experts. This refinery is actually the second that the Republic built on Quesh. The first was destroyed when contaminants polluted the refining process, causing the processed Quesh venom to eat through the vats and then the lower refinery floor. The high walls around the current refinery are not only for defensive purposes, but to contain any future accidents or acts of sabotage. The Republic's center of operations on Quesh was established roughly ten years ago. Initially housing civilian miners, medical professionals and scientists, these workers gradually moved on to smaller camps elsewhere. When the Empire attacked Quesh, the old miners' quarters were quickly converted into a barracks and the entire site was turned over to the Republic military. Many newly arrived soldiers remark upon the Operational Headquarters' light defenses, especially considering the high-level personnel stationed there. In fact, the headquarters' best protection is the large Quesh venom pipelines nearby. In a dire emergency, the pipelines can be vented, causing a massive biohazard to slow any aggressors while personnel are evacuated. Freed from the Hutt Cartel's watchful eye, the Three Families have grown immensely wealthy on Quesh--and as their influence grows, the Three Families have begun solidifying their power base. A large portion of their profits from the adrenal refineries was spent building a lavish palace, complete with all modern conveniences and an impressive security network. Much more than a simple defensive position or status symbol, the Three Families Palace is intended to be a clear statement that the Three Families are wholly committed to defending Quesh. The Palace has generally been kept off-limits to Republic personnel, especially the local military officials. This is partly for security reasons, as the Three Families keep their sensitive files close at hand. Portho the Hutt's indulgence in adrenals has also become something of an embarrassment in recent years. After several inappropriate comments from Portho to the Republic commanders, the Three Families prefer to simply keep him out of sight. When the Empire attacked Quesh, the Three Families initially coordinated the defense from their palace, but quickly realized they needed a more efficient operational post. They poured money into establishing a defensive point between their headquarters and the Republic base, and in a matter of days, the war camp was set up, supplied and staffed--an object lesson in how Hutts react when their credits are at stake. Broga, the head of the Three Families, spends much of his time at the war camp since his private palace was captured by the Empire. His role is twofold: firstly, overseeing his forces as they coordinate with the Republic military, and secondly, ensuring that Republic forces are not passing on any of the Three Families' secrets concerning the handling of Quesh venom. The Yuna Bore mine was once known for two strange treasures: Quesh venom and bones. The first miners found a fossil bed containing remains of Quesh's prehistoric creatures, preserved by rising silt and venom deposits after the big Quake. Since the Republic was only interested in the Quesh venom, the miners were free to recover the bones, ship them offworld and sell them to collectors and paleontologists on Coruscant. This turned out to be immensely profitable. Many miners were able to buy out their contracts on profits from the fossils alone. Even today, with the fossil bed cleared, the Yuna Bore remains productive, as the miners' attempts to discover more bones have driven the tunnels on well ahead of schedule. Once a lush tropical swamp, Quesh's atmosphere became toxic after a series of quakes released dangerous chemicals contained below the planet surface. Most of the native wildlife died off, and Quesh became poisonous to virtually all higher species. Quesh's toxicity is also its source of value--the chemicals that poisoned the atmosphere are usable in the most powerful adrenals and stimulants. 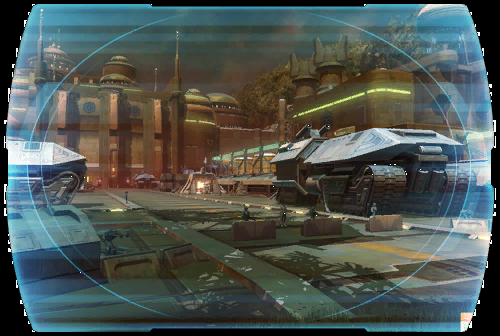 The Republic, with the aid of the Hutt Cartel, has staked a claim to Quesh and is attempting to establish chemical mines. Upon learning of Quesh's existence, the Empire quickly established a presence of its own.